The mystery behind the look-alike of Samsung Galaxy S8 and Galaxy S8+, Galaxy Note 8 having fingerprint scanner still continues. The year 2017 started off with a bang for the smartphone industry, and in the first six months, the market was flooded with smartphones such as Galaxy S8+, Xperia XZ Premium, HTC U11, etc. Each phone showed at least one unique feature in order to outdo its competitors in the race. And the second half of 2017 seems to be no less promising! Various smartphones such as Galaxy Note 8, iPhone 7s, Google Pixel 2, iPhone 8, etc. are expected to be launched later this year. The rumors of Galaxy Note 8 having fingerprint scanner may or may not be true. However, we’ll share pictures in both the cases so as you can imagine how it would look with or without rear fingerprint scanner. A week ago, there were rumors that Samsung Galaxy Note 8 will have Infinity Display, uniform ports, stereo speakers and rear camera. And to reduce the bursting events to zero for Galaxy Note 8, LG will come to Samsung’s aid for supplying powerful yet safe batteries. We believe that the ultimate success of Note 7, Galaxy S8 and Galaxy S8+ is not hidden from anyone. 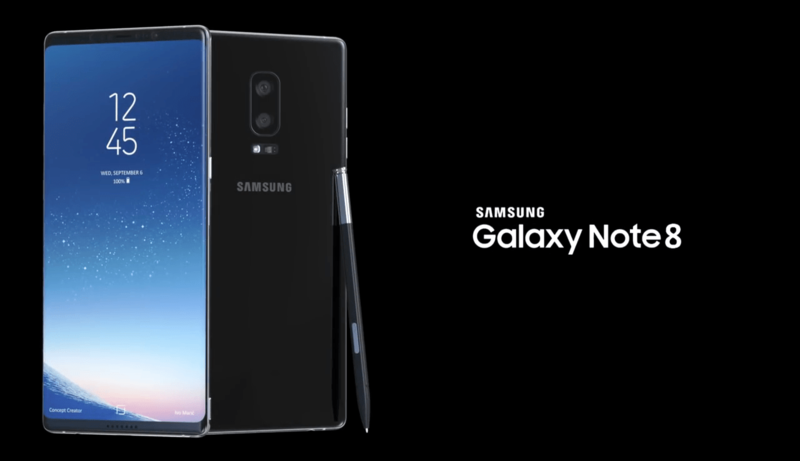 And for Galaxy Note 8, Samsung will strive to come up with something more promising to meet expectations of its existing and new customers. Rumors ranging from hardware specifications to mind-boggling features about this giant smartphone are out, but what’s grabbing more of our attention is its fingerprint scanners. As per the sources, Benjamin Geskin has developed its exclusive batch, and it will be possibly available in two variants. The first variant will sport a fingerprint scanner inserted in the display, while the second one will have a rear fingerprint scanner. Further, it will have an S Pen along with more appealing display corners. Let’s wait for Samsung’s final statement for Note 8 and see whether our speculations about Galaxy Note 8 having fingerprint scanner hold true or not.